20 April - Opening California Farmers Market of the 2019 Season!! Posted 4/13/2019 5:17pm by David Paulk. The 2019 California ("BAE") Farmers Market officially OPENS a week from today ----- Saturday, 20 April (9 am - 1 pm)!!! We will have plenty of cool season, certified organic vegetables to welcome you back to eating fresh from our farm. Look for our Friday evening email letting you know what we'll have at market the next day. In addition, the market has some new vendors to check out including new bakers and a brewery! So, we hope to see you, your friends and family at the Saturday California Farmers Market this year! We've missed you and can't wait to see you and catch up. We hope that you are all doing very well. Posted 11/16/2018 4:18pm by David Paulk. Tomorrow is the last market of this 2018 season AND we have a lot of what you need for your Thanksgiving dinners! 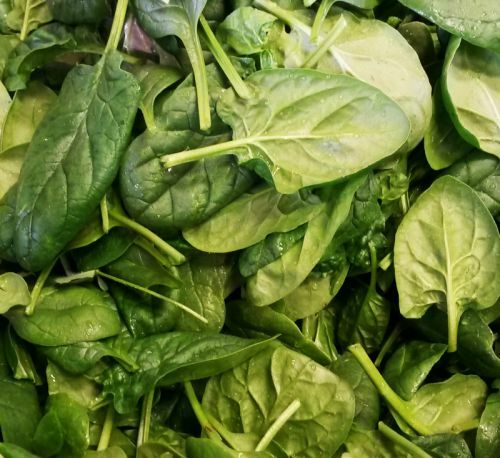 We have frost-kissed and; therefore, sweeter, freshly-harvested Spinach, Carrots, Salad Mix, Kale, Arugula, Beets, Sweet Potatoes, Irish Potatoes and much more. Please see the complete list and Photos of the Week below. Check out sassafrascreekfarm.com/recipe for simple recipes. It has been such a great season! We are happy to say that we have met many new customers this year who have discovered our market and stand. We are also grateful to all of our wonderful, loyal customers who have been buying our vegetables over the years. We have grown to know you and your families and will miss seeing you all each week. Thank you so much!! You can continue to follow our farm happenings over the winter at our Web site (sassafrascreekfarm.com), Facebook page, and at Instagram. You can continue to find our produce at the The Good Earth Natural Foods Store in Leonardtown and Chesapeake's Bounty Stand in St. Leonard until the market starts again at the end of April. - Salad Mix (Back! ): Fresh-harvested variety of green and red salad greens. Ready for your Thanksgiving table. - Spinach (New! ): Delicious, versatile green that is great as a salad or sauteed. - Green Peppers (New! ): Beautiful, glossy green and crisp, savory peppers that are wonderful in any vegetable dish, and especially great for stuffing! They will keep for 2 weeks in your fridge! - French Breakfast Radishes (New! ): Such pretty pink and white radishes that are more mild because of the cold weather, but still have a slight kick. - Beets, Red: Delicious on a bed of arugula with goat cheese and a drizzle of raspberry-walnut dressing. Either roast with skin on and then rub off skins once cool, or peel, slice and boil until fork tender. Serve warm with a little butter or cool on a salad. - Broccolini (limited quantity): Tastes like broccoli, but more mild and delicious. Cook just like you would broccoli. - Cabbage (green and few small red): Not too big, fresh, crisp and slightly sweet! 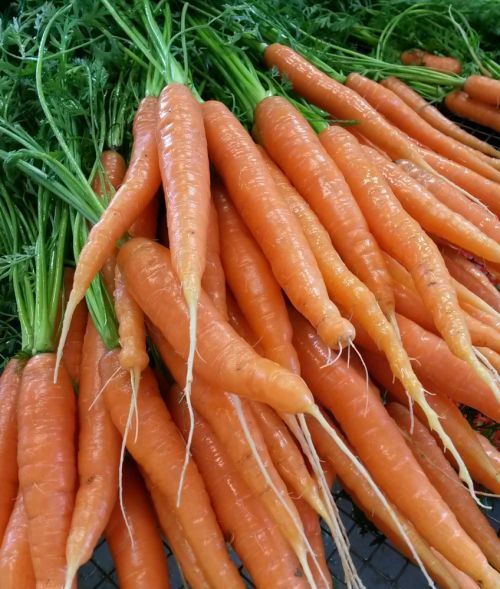 - Carrots: We have plenty of freshly-harvested, sweet carrot bunches and topped in 2-lb bags! Perfect for roasting, soups and stews! - Jerusalem Artichokes (a.k.a, Sunchokes): And yes! We have Jerusalem Artichokes. They are really good roasted and taste like fresh artichoke hearts. If you like artichokes, you'll like sunchokes. - Kale, Two kinds! 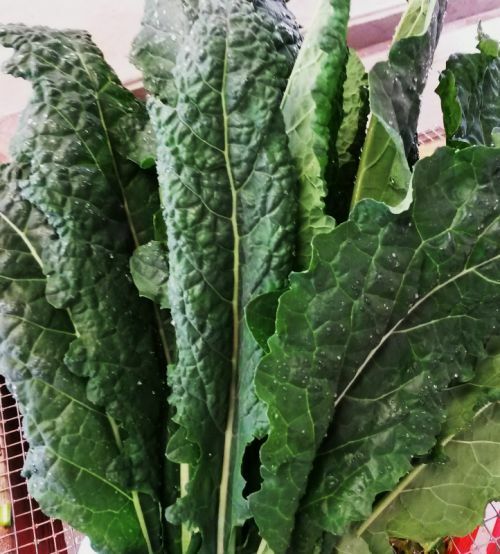 : We have both traditional curly kale and Italian Lacinato Kale. Wonderful sauteed, in soups or eat raw in a salad or add to your smoothie for a nutritious boost! 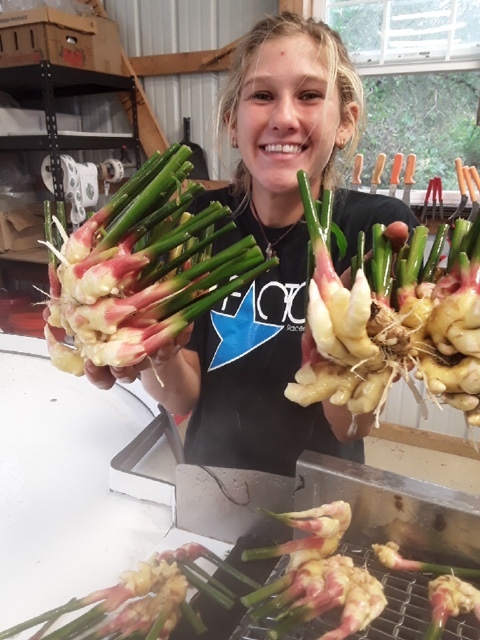 - Leeks: Beautiful bunches of leeks. Their mild onion, but distinctive flavor is key to a number of dishes, especially in potato-leek soup or with fish. See recipes on our Web site! - Lettuce, Little Gem (red & green): tasty smallish head lettuce. Mix a head of read and head of green for a colorful, delicious salad. They are like a crisp bibb lettuce. - Lettuce, Romaine: freshly-harvested, crisp romaine. 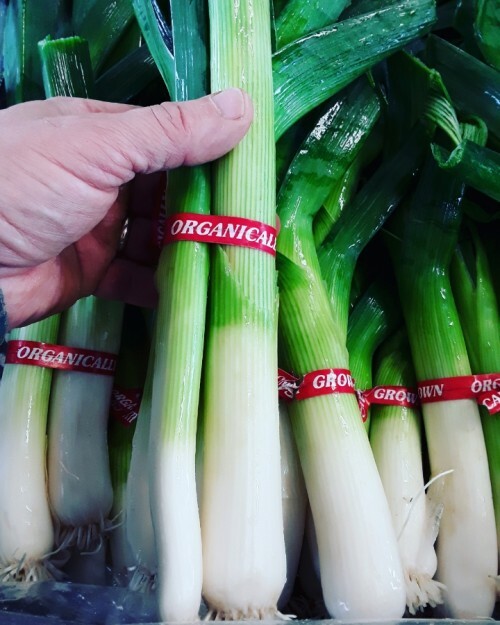 - Superstar Sweet Onions: white, sweet and crisp like a vidalia or walla walla. Great raw, roasted, sauteed or used in soups (think mirepoix). - Sweet Bell Peppers: Large and Small bells...perfect for sauteing and stuffing! 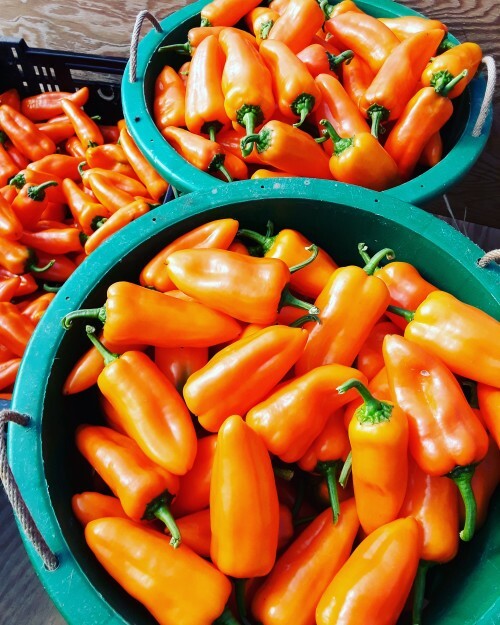 - Oranos (orange) Sweet Peppers: Sweet, orange and crisp peppers. Great raw, sauteed or grilled! They freeze really well! Think about putting some up for the winter. Ask us about it at our stand. - Potatoes, Mt. Rose, Butterball, Blue, Carola & Desiree: Five delicious varieties with different flavors and cooking qualities. Cut in quarters, toss with a little olive oil and bake at 350 degrees F until fork tender, longer if you want them to crisp up. Sprinkle with sea salt for a tasty, easy, nutritious side dish. - Radicchio: Yes, we have radicchio! If you've never tried it, now's your chance. Recommend roasting olive oil rubbed leaves, then just salt and eat as a side dish or cut up and toss with pasta. - Radishes, lollipop (and french breakfast, see above): pretty colorful and tasty with a mild kick due to our cooler weather. 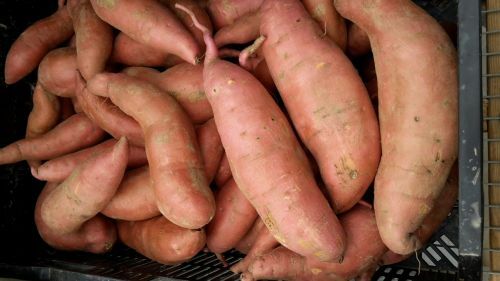 - Sweet Potatoes, Beauregard: Yes, we have the first traditional sweet potatoes of the season...just in time for the start of fall! You can eat these baked, roasted or mashed...and at any time of the day! PLUS, they are so good for you. - Sweet Potatoes, Murasaki: Purple (white inside), Japanese sweet potatoes have a lovely vanilla/hazelnut flavor and even though they don't get as sweet as the orange ones, that just means they are even more versatile in using them as you would Irish potatoes. Posted 11/9/2018 3:43pm by David Paulk. We have a wide variety of delicious vegetables for you tomorrow including celery, lots of sweet green beans, carrots, chard, kale and more! See the long list below of fresh, certified organic veggies grown just for you! It should be a bit nippy, but sunny (hallelujah!). So, swing by the market and stock up on veggies for the week! To help you plan your visit, please go to sassafrascreekfarm.com/recipe for easy, simple recipes for all of our produce. We so appreciate your support and love to see you and hear how you are doing! Only 2 more markets before the end of the California Farmers Market season (and start of the holiday season)! - Celery (New! ): Farm fresh celery is such a treat compared to store-bought. It is so much sweeter and aromatic. It will make a difference in your stuffing, roasts, and soups. - Rainbow Chard (Back! ): We have delicious rainbow chard! Saute like you would kale, with some sweet onion and enjoy! - Broccolini: Tastes like broccoli, but more mild and delicious. Cook just like you would broccoli. - Beets (Red & Chioggia): Delicious on a bed of arugula with goat cheese and a drizzle of raspberry-walnut dressing. Either roast with skin on and then rub off skins once cool, or peel, slice and boil until fork tender. Serve warm with a little butter or cool on a salad. - Cabbage: Not too big, fresh, crisp and slightly sweet! 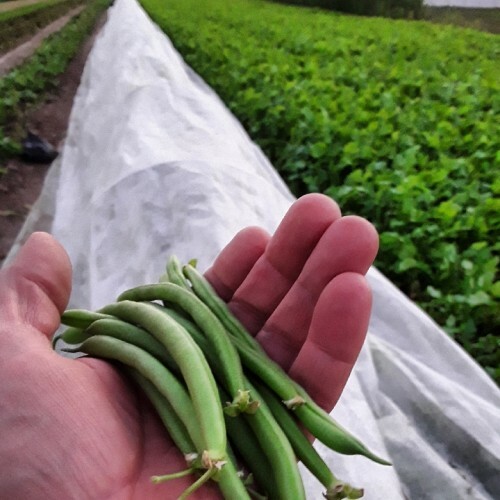 - Green Beans: We have the most at this market than we've had yet of this special late planting of green beans; kissed by frost and so sweet and crisp tender! - Lettuce, Romaine: plenty of freshly-harvested, crisp romaine. - Radishes, lollipop: pretty colorful and tasty with a mild kick due to our cooler weather. Posted 11/2/2018 4:46pm by David Paulk. The bounty of fall is here! We have a much wider variety of delicious vegetables, plus, they have been "frost-kissed." The frost makes them sweeter and tastier! See the long list below of fresh, certified organic veggies grown just for you! So, swing by the market and stock up on fresh, certified organic veggies for the week! To help you plan,visit sassafrascreekfarm.com/recipe for easy, simple recipes for all of our produce. We so appreciate your support and love to see you and hear how you are doing! Only 3 more markets before the end of the California Farmers Market (and start of the holiday season)! - Leeks (New! ): Beautiful bunches of leeks. Their mild onion, but distinctive flavor is key to a number of dishes, especially in potato-leek soup or with fish. See recipes on our Web site! - Red Onions: Last of the season! - Cabbages: Not too big, fresh, crisp and slightly sweet! - Green Beans: Special late planting of green beans; kissed by frost and of so sweet and tender! - Superstar Sweet Onions: white, sweet and crisp like a vidalia or walla walla. - Radishes, Ostergruss: These are long and look like red carrots! Super crisp and tasty with a kick! - Radishes, Red round (limited quantity): first harvest of a new planting. - Fresh Turmeric (still have a little bit left): The queen of natural anti-inflammatory foods is here! Bright orange and tasty grated into salads or added to vegetable dishes. Key ingredient in curries. Add to smoothies for an anti-inflammatory bonus. Delicious grated on eggs in the morning. - Turnips, Japanese Hakurei: These are not your parents' turnips! They are crisp, white, and slightly sweet. Even better raw, than cooked! Simply saute diced turnips with greens and sweet onions! See recipes on our website. Posted 10/26/2018 5:09pm by David Paulk. Fall is definitely here! We've had several frosty nights that have sweetened up our veggies, such as kale, carrots, green beans and more! The fall means a much wider variety of delicious vegetables. We have 6 new vegetables for you to try (see below)! Please don't be deterred by the weather...it may be sprinkling when you come to market (44% chance), but chance of rain decreases throughout the day. Swing by the market and stock up on fresh, certified organic veggies for the week! To help you plan,visit sassafrascreekfarm.com/recipe for easy, simple recipes for all of our produce. We so appreciate your support and love to see you and hear how you are doing! Only 4 more markets before the end of the California Farmers Market (and start of the holiday season)! - Green Beans (New! ): Special late planting of green beans; kissed by frost and of so sweet and tender! - Broccolini (New! ; limited quantity): Tastes like broccoli, but more mild and delicious. Cook just like you would broccoli. - Cabbage (New! ): Fresh, crisp and slightly sweet! - Carrots (More! ): We have plenty of freshly-harvested, sweet carrot bunches and topped in 2-lb bags! Perfect for roasting, soups and stews! - Little Gem Lettuce (New! ): small red and small green heads of Little Gem lettuce. A petite, more delicate romaine! - Radicchio (New! ): Yes, we have radicchio! If you've never tried it, now's your chance. Recommend roasting olive oil rubbed leaves, then just salt and eat as a side dish or cut up and toss with pasta. - Jerusalem Artichokes (a.k.a, Sunchokes; New! ): And yes! We have Jerusalem Artichokes. They are really good roasted and taste like fresh artichoke hearts. If you like artichokes, you'll like sunchokes. 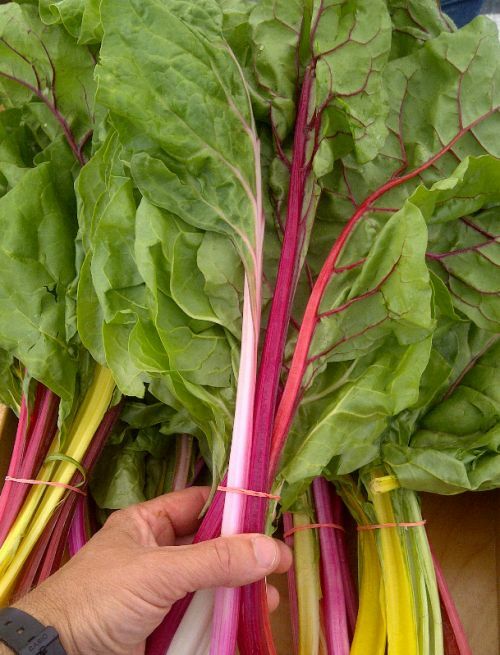 - Rainbow Chard: Chard is delicious simply sauteed, leaves and stocks, with sweet onions or garlic! Toss in some raisins and pine nuts for a healthy Mediterranean twist. - Fresh Turmeric: The queen of natural anti-inflammatory foods is here! Bright orange and tasty grated into salads or added to vegetable dishes. Key ingredient in curries. Add to smoothies for an anti-inflammatory bonus. Delicious grated on eggs in the morning. Posted 10/19/2018 6:00pm by David Paulk. The nip of fall is in the air! This means it's time for the bounty of cool season veggies. Tomorrow, you'll see carrots, more greens, radishes and lettuce, and much more. Consider "putting up" sweet Oranos peppers for the winter by freezing them! They freeze really well! Just ask at our stand. Swing by the market and stock up on fresh, certified organic veggies for the week! To help you plan,visit sassafrascreekfarm.com/recipe for easy, simple recipes for all of our produce. We so appreciate your support and love to see you and hear how you are doing! Only 5 more markets before the end of the California Farmers Market (and start of the holiday season)! - Carrots (New! 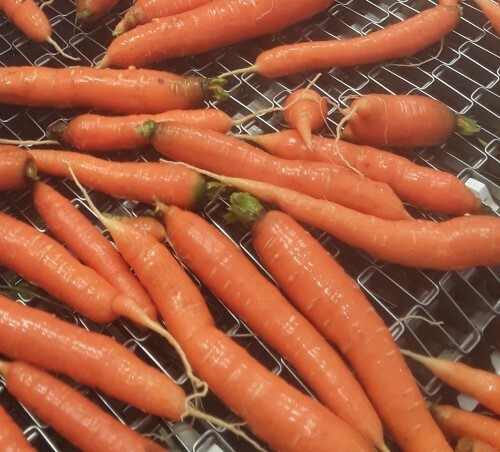 ): We have plenty of freshly-harvested, sweet carrots in 2-lb bags! Perfect for roasting, soups and stews! - Fresh Baby Ginger: what you've all been asking for is finally here! Freshly-harvest ginger has no tough skin. It is baby pink and crisp-tender. It doesn't need to be peeled before grating. Naturally sweet and aromatic. Simply grate and add to any vegetable, fish, fruit dish. Make herbal tea! It freezes really well, so none goes to waste. Sassafras Creek Farm Recipes. - Lettuce, Romaine and Greenleaf: plenty of freshly-harvested, crisp romaine and frilly, delicious greenleaf. - Radishes, Ostergruss: These are long and look like red carrots! Super crisp and tasty! Posted 10/12/2018 4:53pm by David Paulk. Now it's really starting to feel like fall with these cooler temperatures that favor cool season crops. You'll see tomorrow more greens, radishes and lettuce, and much more. 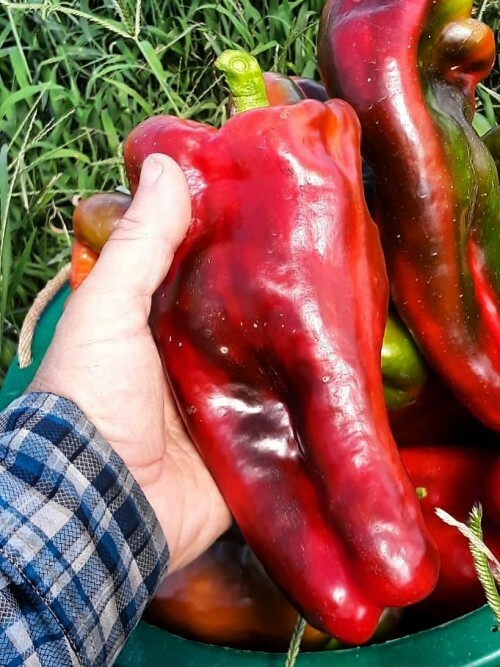 Consider "putting up" sweet Oranos peppers for the winter by freezing them! They freeze really well! Just ask at our stand. What a beautiful day to swing by the market and meet friends and family to stock up on fresh, certified organic veggies for the week! To help you plan,visit sassafrascreekfarm.com/recipe for easy recipes using all of our produce. We so appreciate your support and love to see you and hear how you are doing! Only 6 more markets before the end of the California Farmers Market (and start of the holiday season)! - Potatoes, Butterball (New! ): delicious, waxy potatoes, which means they are great for soups, mashed potatoes or simply boiling and eating with a little butter..
- Radishes, Ostergruss (New! ): These are long and look like red carrots! Super crisp and tasty! - Sweet Potatoes, Murasaki (New! ): Purple (white inside), Japanese sweet potatoes have a lovely vanilla/hazelnut flavor and even though they don't get as sweet as the orange ones, that just means they are even more versatile in using them as you would Irish potatoes. - Garlic: Last of the season garlic! We'll have for only a few more markets. - Lettuce, Romaine: plenty of freshly-harvested, crisp romaine! - Sweet Bell Peppers: LARGE bells...perfect for the grill! - Potatoes, Mt. Rose, Butterball (New! ), Blue, Carola & Desiree: Five delicious varieties with different flavors and cooking qualities. Cut in quarters, toss with a little olive oil and bake at 350 degrees F until fork tender, longer if you want them to crisp up. Sprinkle with sea salt for a tasty, easy, nutritious side dish. - Sweet Potatoes, Beauregard: Yes, we have the first sweet potatoes of the season...just in time for the start of fall! You can eat these baked, roasted or mashed...and at any time of the day! PLUS, they are so good for you. - Radishes, Red: love these fresh, crunchy and spicy radishes! - Tomatoes, Red Slicers (limited quantity): Last of the Season! Posted 10/5/2018 12:10pm by David Paulk. It's the start of fall and a wonderful time of year to enjoy an outing at the market with your friends and family to stock up on fresh, certified organic veggies for the week! To help you plan,visit sassafrascreekfarm.com/recipe for easy recipes using all of our produce. We so appreciate your support and love to see you and hear how you are doing! - Kale, Two kinds! (New! ): Yay! Kale is back! We have both traditional curly kale and Italian Lacinato Kale. Wonderful sauteed, in soups or eat raw in a salad or add to your smoothie for a nutritious boost! - Fresh Turmeric (New! ): The queen of natural anti-inflammatory foods is here! Bright orange and tasty grated into salads or added to vegetable dishes. Key ingredient in curries. Add to smoothies for an anti-inflammatory bonus. Delicious grated on eggs in the morning. - Turnips, Japanese Hakurei (New! ): These are not your parents' turnips! They are crisp, white, and slightly sweet. Even better raw, than cooked! Simply saute diced turnips with greens and sweet onions! See recipes on our website. - Radishes, Red (More this week! ): love these fresh, crunchy and spicy radishes! - Beets (Red, Golden & Chioggia): Delicious on a bed of arugula with goat cheese and a drizzle of raspberry-walnut dressing. Either roast with skin on and then rub off skins once cool, or peel, slice and boil until fork tender. Serve warm with a little butter or cool on a salad. - Rainbow Chard: Yay! Greens are here! Chard is delicious simply sauteed, leaves and stocks, with sweet onions or garlic! Toss in some raisins and pine nuts for a healthy Mediterranean twist. - Fresh Baby Ginger: what you've all been asking for is finally here! Freshly-harvest ginger has no tough skin. It is baby pink and crisp-tender. It doesn't need to be peeled before grating. Naturally sweet and aromatic. Simply grate and add to any vegetable, fish, fruit dish. Many uses. Check out Sassafras Creek Farm Recipes. - Lettuce, Romaine: freshly-harvested, crisp romaine! - Salad Mix: Freshly-harvested salad mix is delicious and keeps a long time! Posted 9/28/2018 2:12pm by David Paulk. It's the best of both seasons, the bounty of summer and early fall, a wonderful time of year to enjoy an outing at the market with your friends and family to stock up on fresh, certified organic veggies for the week! To help you plan, visit sassafrascreekfarm.com/recipe for easy recipes using all of our produce. We so appreciate your support and love to see you and hear how you are doing! - Fresh Baby Ginger (More! ): what you've all been asking for is finally here! Freshly-harvest ginger has no tough skin. It is baby pink and crisp-tender. It doesn't need to be peeled before grating. Naturally sweet and aromatic. Simply grate and add to any vegetable, fish, fruit dish. Many uses. Check out Sassafras Creek Farm Recipes. - Radishes, Red (New! ): love these fresh, crunchy and spicy radishes! - Sweet Potatoes, Beauregard (New! ): Yes, we have the first sweet potatoes of the season...just in time for the start of fall! You can eat these baked, roasted or mashed...and at any time of the day! PLUS, they are so good for you. - Rainbow Chard: Yay! Greens are back! Chard is delicious simply sauteed, leaves and stocks, with sweet onions or garlic! Toss in some raisins and pine nuts for a healthy Mediterranean twist. 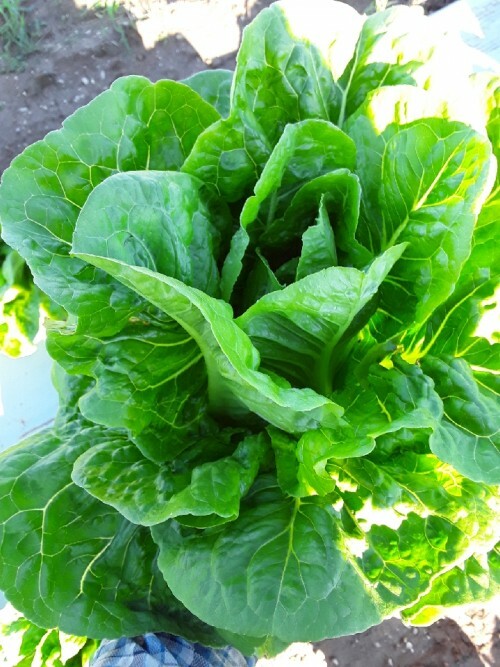 - Lettuce, Romaine (limited quantity): freshly-harvested, crisp romaine! 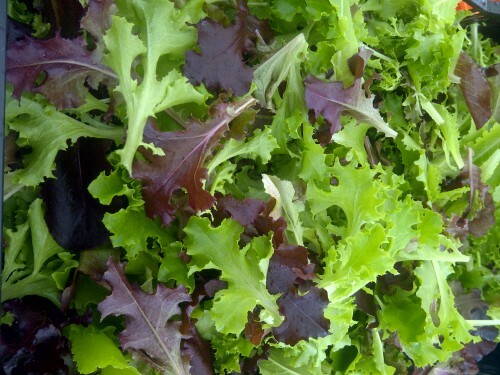 - Salad Mix (limited quantity): Freshly-harvested salad mix is delicious and keeps a long time! - Tomatoes, Green (unripe): If you've never tried fried green tomatoes, now's your chance! - Zucchini (two kinds!) : Traditional, but always delicious, and Flaminio Zucchini! 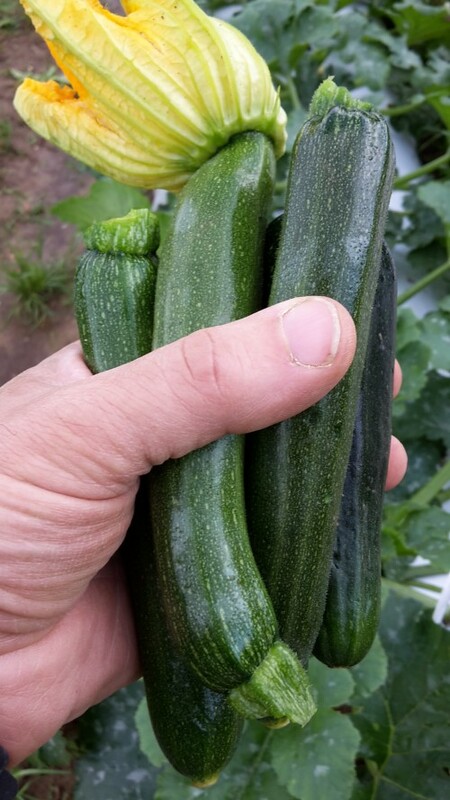 Try this tasty, slightly nutty new variety of Zucchini we are trying out. It's striped and as the Italians would say it has a "costata" appearance. We love it! Posted 9/21/2018 3:43pm by David Paulk. How about coming by the farmers market tomorrow and supporting your local farmers before you go to the County Agricultural Fair! Bring your friends and family to stock up on fresh, certified organic veggies for the week! We are so happy to be your farmer and grow for you! Thank you for supporting our farm! - Fresh Baby Ginger (New! ): what you've all been asking for is finally here! Freshly-harvest ginger has no tough skin. It is baby pink and crisp-tender. It doesn't need to be peeled before grating. Naturally sweet and aromatic. Simply grate and add to any vegetable, fish, fruit dish. Many uses. 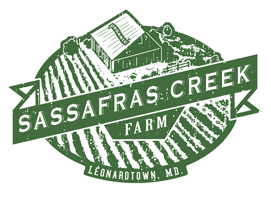 Check out Sassafras Creek Farm Recipes. - Rainbow Chard (New! ): Yay! Greens are back! Chard is delicious simply sauteed, leaves and stocks, with sweet onions or garlic! Toss in some raisins and pine nuts for a healthy Mediterranean twist. - Salad Mix (New! ): Freshly-harvested salad mix is delicious and keeps a long time! - Turmeric (New! ; limited quantity): First of the season...The queen of anti-inflammatory is here! Bright orange and tasty grated into salads, soups or a sauteed vegetable dish. Key ingredient in curries. Add to smoothies for an anti-inflammatory bonus.